"Dance of the Blessed Spirits" is a ballet excerpt from Christoph Willibald Gluck's opera Orfeo ed Euridice, which is based on the story of Orpheus from the Greek mythology. The opera was first performed at the Burgtheater in Vienna on 5 October 1762. Orfeo ed Euridice was the first of Gluck's operas in which he broke with the prevailing opera conventions where the complex music and plot from the traditional 'opera seria' made place for clean and simpler designs. Given the performance happened for the birthday of Emperor Franz of Austria, Gluck was forced to reform the bloodthirsty end. The work contains a famous flute solo. There is, of course, danced and then Euridice (one of the Blissful Spirits) sings a solo. This is one of the most famous mythical love stories in world literature. The story is told by both Ovid and Virgil. The demigod Orpheus can bring with his singing and stringed instruments (the harp) people, animals, plants, gods, and even stones and unfeeling monsters into raptures. 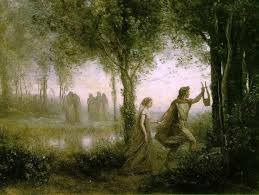 Orpheus loses his beloved nymph (and woman) Eurydice after she is bitten by a poisonous snake. Through his lamentation surrounded the thus become tame wildlife him and the trees kept their rushing in. Heartbroken, he decides to descend into Hades to beg the god of the underworld to give her back. Moved by his love Hades agrees to this. But there is one condition: he must not look back to his beloved before they are safe together again in the world of men. He fails at the end, and lose his beloved again. Orpheus then turns increasingly off everyone. Only after (after three years) a group Maenads, blind hatred, tear him alive to pieces, his soul floats down to Hades, where he is at last reunited with Eurydice.